Vytas praises the tribe as a fan of the show for an awesome blindside. Tina doesn't take it as well, saying Monica and Tyson have lost five jury votes for flipping. But everyone knows Aras had deals with everyone so he had to go. And so begins the most obvious week of knowing that soon Vytas, Tina and Katie will get picked off. Tina urges Katie to try to get herself further in the game because the Tina target is huge. The tribe meets Probst at the beach but there's not a puzzle to be seen (hallelu!) 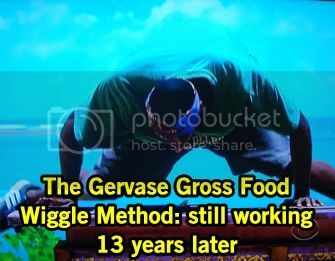 It's a gross eating challenge, a true Survivor classic! Competing in elimination rounds, there's some nasty shizz. You can tell it's gross because everyone's jumping up and down and gagging on their delicacies. Meal worms, pig intestines, and grubs. Monica and Gervase are the final two competitors and 13 years later, Gervase has to confront grubs a second time. The wheezing and heaving noises as the two attempt to swallow the grubs. Monica wins immunity and Gervase is left with grub residue in his teeth. The plan is to split the votes between Vytas and Katie in case there's an idol. Tyson knows it's a waste to split it since he has the idol. Vytas tries to get with the guys on his side, begging to be the 3 in a 4/3 split vote. He even uses his jury vote as leverage. Tyson sees some positive in keeping Vytas as a way to squash a girl's alliance. And for some reason, Monica is worried about the scrambling eventhough she's immune. Tribal Council time! 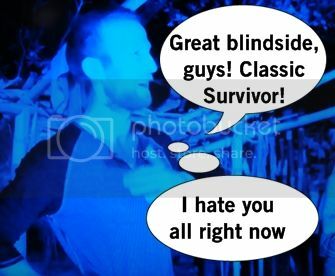 Probst asks about life post-blindside, and Vytas does express his anger at losing his brother. But he also knows it's a game and Aras was playing it. Vytas even calls out Monica for being a doormat, flipping on him and the bond they had. He brings up the girls being tight and you might need to get one of them out over him. Oh Vytas, you're running your mouth too damn much but it's so awesome. 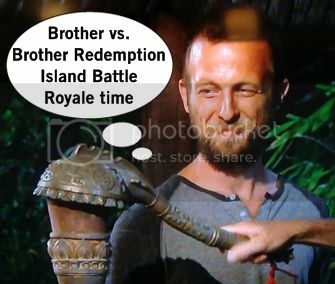 It's Vytas going out in a blaze of glory, torch snuffed out, and heading to bro out and bicker about who ruined the game with Aras on Redemption Island. 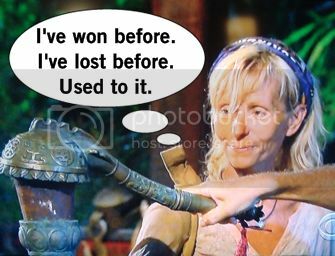 Back at camp, Monica brags about how she switched her vote last minute to get revenge on Vytas. Gervase isn't pleased but what if something went wrong? He's right. Also, Monica is beyond annoying. But it's double Tribal Council night so enough of this BS, let's compete in another challenge. The challenge is to hold onto a sword while balancing coins on the handle. You know, what any reasonable person does with a sword. The coins start scattering like a klutz buying lunch. Katie wins individual immunity in a final showdown with Hayden and Tyson. So basically, she sealed her mom's fate. Tina's fate is obvious but she tries to make headway by searching for the idol. The entire tribe follows her because Tyson can't admit he has the idol. Yet again, everyone wants to split votes because what if Tina found an idol? Monica's on the bottom because she's paranoid about everything, so if they did split votes it would have to be her. So come Tribal Council time, Tina explains how she had babysitters following her every move but escaped twice for some alone time. Oh and tells Monica she's on the bottom, who denies and claims she's working with others within the seven yet acknowledges she has no partner like the others. Monica talks too much and it's her biggest flaw, which she continues to run on during Tribal. Tina tells it like it is, because she's awesome, and even jokes about finding the idol. It's no use and we're stuck with Monica another week as Tina is the 10th person voted out.